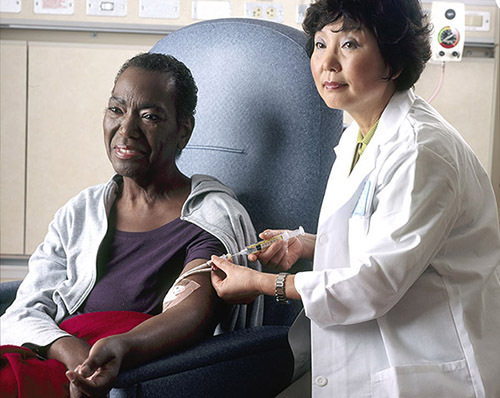 Clinical outcomes over the years have led cancer researchers to the supposition that African Americans have a higher death rate and shorter period of survival among patients with commonly diagnosed cancers. The underlying cause of these scenarios has produced some hypotheses—many focused on whether socioeconomic factors contribute to the increased mortality statistics. Furthermore, scientists have been searching for a genetic basis for these disparities, with the hope of uncovering therapeutic interventions that could address this seemingly ethnic bias. Now, investigators at The Wistar Institute have pinpointed a single variant in a gene that is only found among Africans and African Americans that makes cancer resistant to cell death and may contribute to the increased cancer risk. Dr. Murphy and her colleagues studied variants of p53, a tumor suppressor gene that is mutated in the vast majority of cancers. One particular variant, S47, is restricted to people of African descent, occurring in approximately 2% of African Americans and up to 8% of Africans. The Wistar scientists created a mouse model that contained the S47 variant, in order to study the impact of this mutation in otherwise genetically identical organisms. The researchers seek to make this physiologically relevant model system widely available to scientists investigating new treatments for patients with the S47 genetic variant—with the overall goal of developing new diagnostic and efficacious treatment regimens. Surprisingly, the Wistar team also found that spontaneous cancer occurred in 80% of the mice with the variant. Liver cancer, lymphoma, and colorectal cancer occurred most frequently in the mice with the S47 variant. These findings are in agreement with clinical data that shows liver cancer is more common in African Americans, as well as the fact that colorectal cancer is responsible for approximately 9% of all newly diagnosed cases of cancer among African Americans.